Okay, so you have been assigned to make recommendations for the purchase of new chairs for your church. Where do you start? Who do you call? What can you get for the budget that you have been allocated? These are the issues people face every day when making a chair purchase. 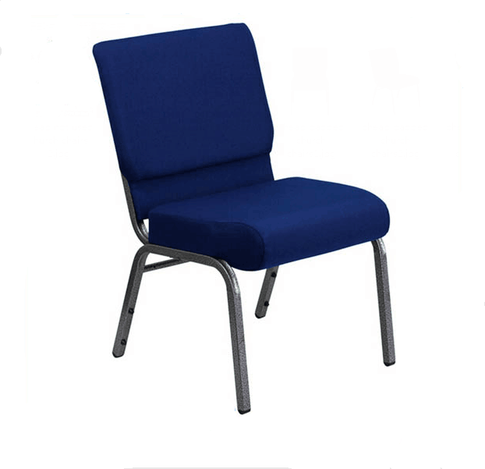 There are many factors that you should consider starting your quest for the perfect church chair for your application. Find out who the chair is for. Will it need to be a stackable chair? Does it need to be ergonomic? Will it require additional options like ganging connections, tablet top, communion cup holder and so on? The more questions you ask and answer now, the more time and money you will save in the future. An ergonomic chair is a chair that provides comfort in both the seat and back to the user. This is very important when it comes to comfort. It allows you to sit properly at all times. Many institutions are now recommending ergonomic chairs vs. the traditional chairs. Back problems are becoming an epidemic. With the help of the ergonomic posture, it relieves the stress put on the user’s back. Most chair manufacturers give sample chairs to potential clients at a discounted rate (most will just charge for shipping). Get a sample chair and have people sit on it. This step involves some money, but you'll get to see what the chair looks like and feels up close, which can reveal things that you like or dislike about the chair. Another buying tip is to look for warranty on the chair. If a warranty covers the chair for only a couple of years, then the chair quality might be questionable. Also, it's all about quantity. Most manufacturers sell chairs in volume. The more you buy, the more you save. Prices usually range with the quantity you are buying. Ask for the number of chairs and the discount associated with them. You might be three chairs away from additional savings. For example, if you buy 100 chairs, you might receive a 35 percent discount, but if you buy 105 chairs, you might receive a discount of 40 percent. Sometimes it's worth buying the additional chairs due to the discount. The extra five chairs might be needed down the road. The final tip is available options. Imagine this. You have just purchased some chairs for your church. You know the chairs are stackable and have a great warranty. Then you are told that you will also need to use the chairs for Sunday school and you will need tablet tops for the students. You chair does not have a tablet top option. A real problem arises. Make sure that your chairs will have the capabilities to add options like ganging connections, tablet top, book racks, etc. This will save you time and money down the road.